CTS was contracted to provide an electromagnetic lifting system for a rolling mill to handle bundles of reinforcing bar varying from 5.8 m to 21 m in length, with the diameter of the product ranging from 6 mm to 40 mm. The maximum weight of a single bundle was 2.2 tonnes and the system was to be capable of lifting three bundles with a combined weight of 6.6 tonnes. 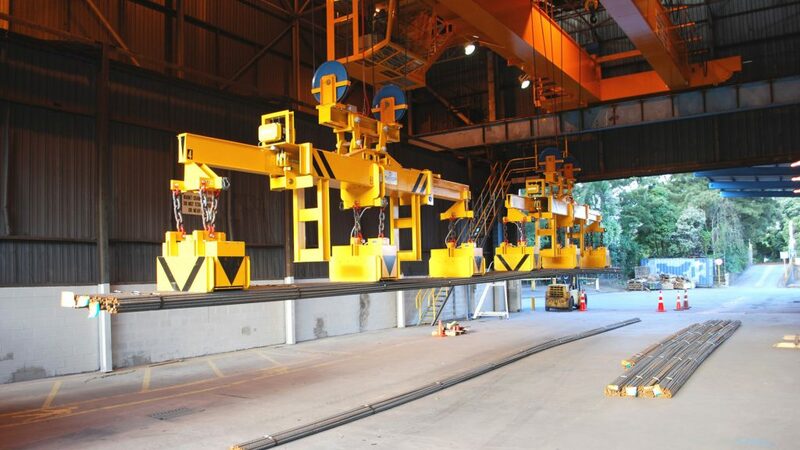 The magnet lifting system was to be installed on a new twin hoist overhead travelling crane. The specification for this application indicated that the cranes were expected to perform 2.5 million lifting cycles over a 25 year period. in accordance with AS 4991 2004. CTS, in conjunction with Truninger, provided a magnet lifting system specifically designed to meet the client’s strict specification. The system included two separate magnet lifting beams, each with three magnet heads. The outer magnets on each spreader beam were actively driven to enable the magnet lifting system to cover the full range of reinforcing bar bundle lengths, whilst the positioning of the magnet spreader beams and magnet heads was automated for ease of operation and to increase the overall efficiency of the rolling mill. The entire configuration was controlled by the Truninger Smartpick system, with the integrated “SmartPick” providing fault finding and statistics analysis. Battery backup was also provided in case of any failure of the overhead crane power supply.